We have been well aware of the approaching cyclone for the past two days. After tracking its movements over these days and with no diversion from a direct path towards Innisfail, today was definitely going to be a day of cyclone preparation. Taking advantage of the cyclone still some considerable distance out to sea, we managed to attend the annual 'Feast of the Senses' festival and a chance to taste the best of the regions tropical fruits. We have had very little rain for our wet season this year and today was no exception with fine clear skies. By early afternoon the festival was being brought to a close as everyone was clearly anxious to get on home and prepare for the oncoming of Larry. In passing and with true Aussie humor many a conversation ended with the statement 'see you later, if we are still here'. 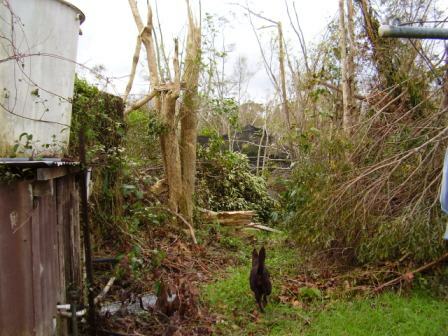 As with any cyclone, we prepared to move from home down to the main office (for the reader: home is located on a ridge and much higher on the property as in comparison to the main house, office, workshop, greenhouses which are located lower in a gully). We have sat through many cyclones in the main house, often seeing the walls and windows flexing from the strong cyclonic wind gusts. Really pleased that only a matter of a couple of weeks ago we had storm shutters installed on the office windows. The rest of the afternoon was taken up with packing away and securing down all that could possibly be done at both houses. Another preparation was as usual the generator but this time it does not seem to want to go, not looking good for this cyclone. If we do as usual loose power, we will obviously have to get the camping gear out, candles, torches and gas cooking. Never mind, the pantry is well stocked with cyclone provisions, baked beans! Eleven pm and there is still a calm atmosphere amongst the skies, no rain. Before retiring for the night we quickly check on the activity around the insect light, very quiet indeed with no large obvious insects flying and only a small handful of micro-fauna. 2am we have lost the electricity. Rains are only light but the winds are noticeably increasing yet still only low enough that I will go back to sleep. 4am and it is impossible to sleep any longer, I can hear the winds are gaining incredible strength rapidly. I get the radio out to start to listen to the progress of the cyclones approach. The local radio station reports the cyclone is approximately 100 kilometers due east of Innisfail, heading in an easterly direction with winds reaching 280 kilometers per hour. In all logic, we are going to be in for a battering, so we now sit and wait for Larry to happen. Now around 6am and daylight is starting to happen, but as daylight comes it is replaced with a heavy grey wall of rain and at this stage I could see only a few fallen trees. From this point we very quickly lost all site of the forest, instead all we can see is a dense deep wall of rain with reduced visibility of a couple of meters. 6.30am and the full force of Larry is undoubtedly on! My best description is a huge turbulent wall of matter and within this wall there are individual turbulent vortexes happening which mostly comprise green leaf matter again swirling in all directions within, all this and an indescribable force of strength attached. Larry is much more intense than any previous cyclone we have ever experienced. The sound is more constant, winds only ever seeming to increase rather than a regular cyclone where the winds come in noticeable gusts. The sound of wind penetrating every crevice possible can be heard all round, high pitch squeals reveal water being forced in gaps I didn't even know existed, and under such pressure the water spurts in like a fountain. Hearing a noise down in the end room Paul and I race to find an air-conditioning unit half hanging out from the window and rain coming in straight onto his bed. To stop the rain entering, the only option was to quickly push out the air-con so we could close off the window. Returning to the radio and the cyclone updates now report the winds up to 290 kilometers per hour. We now take refuge in the strongest part of the house and listen to the winds. The winds belt into the eastern side of the house and in the winds are large objects we could best guess to be branches! It's around 8am now and the winds have quickly stopped, not slowed down as usual, just stopped suddenly! As much as you know not to venture out during the cyclone eye, we can't but wonder what it looks like outside. But you know it; we have to go out to have a look. 8.30am oh boy! We were out having a look around and all of a sudden the winds started again. They picked up so quickly that we found ourselves retreating indoors in a real hurry, actually we found ourselves climbing over the top of each other and there is only the three of us here. Must have looked like something out of an old Three Stooges movie, all three of us clambering over the top of each other. Anyway we got back in and shut the door real quick. In all we had around 30 minutes outside which was obviously the eye, have never been through a cyclone eye before. What's to say about outside, trees down everywhere, right from the moment you step out the front door. We only got to look around the front of the house and already we saw that half the main greenhouse is gone, I can't but wonder what the other greenhouses out the back look like? Now the second wave is happening. The winds are picking up, the walls are starting to flex like sheets of Perspex and another barrage of matter now hits this side of the house. Just out of sheer reflex, you can't help but jump off the chair when something of obvious large proportions belts into one of the window shutters. Glad we thought to put them on a few weeks ago, would sure be looking at a wet office now! 9.15 am and a lady rings to enquire about purchasing some insect pets. Jack quickly took her details and told her we would get back to her. I hope there's some insects left to sell! 10am and the worst seems to have passed with winds slowing down considerably. 10.30 am the rain has stopped and it's all over. Now we will really see what it is like outside. 12.30 pm, returning from our first look at Larry's work and simply nothing seems to have escaped damage, even this house has some minor damage but luckily the roof looks to be still intact. I hope the house up on the ridge has still got its roof. All four greenhouses are damaged, three are completely gone with half of the main greenhouse still standing. Not a single specimen to be found in this house and I can only assume the same is with the other three houses. At this stage it is physically impossible to get to them as the whole area is covered in trees and the crowns from trees, difficult just to even see over the piles of debris. As I looked around I could easily see the direction of the winds. The first is the lower layer of downed timber which lays in one direction then a second layer covers laying in the opposite direction, causing an overall criss-cross effect of timber. Cover this mess with bulk tree crowns and you have what is left standing, NOT MUCH! Looking up, there seems to be no canopy, perhaps it is my initial shock but it doesn't look good. As expected, the road out of the property is closed by trees of all sizes and as usual first priority is to get it open. Power wires are down but not across the road, so we can start to cut our way out. Jack gets on the chainsaw while Paul and I man a machete and grass knife. By 4pm we have managed to cut through to meet the fork in the road (for readers: turn right and you go up the hill to our home, take the left turn to exit the property). At this stage the amount of timber we have moved is staggering and from this point in the road we have another 200 meters to go to the property entrance (for readers: beyond the property the road runs between cane paddocks and is usually not too much of a problem) and onto the main road. Just looking up our road and the amount of work ahead just to open it, I can't help but think how it is outside of the property and what condition Innisfail is in? Late this afternoon, Jack and Paul decide to try and get through to the other house to assess the situation up there. They returned some 45 minutes later, it took that long to cut their way through what is usually a 5 minute walk. From their quick assessment before dark, the roof is still on, which is the main concern. As with the main house, two sides took the brunt of the winds and perhaps some structural damage may have been done. But both houses are still standing, so I consider we are lucky. As the end of our first day comes we have no electricity and the telephone is not working. Tonight's menu is scrambled eggs and baked beans, a cyclone regular. In the morning we will again work on the road, just hope the rain eases up. Rainfall received previous 24 hours - locally 350 mm, difficult to say how much we have received, along with everything else that got blown away so did the rain gauge! Well the rain is still around and looks like it will be setting in for the day. Waking up this morning I initially forgot what the rainforest looked like now, one glance and I stood there shaking my head in total disbelief. It seems as if the whole of the rainforest has literally been blown away! From what was a thick dense wall of green forest, now it is possible to clearly see through the forest, up and down gullies, even right down to the bare dirt from where trees, roots and all have been ripped out! Morning radio reports are very grim, Larry reached a staggering 350 km across, first making landfall at Innisfail, continued on up over the tablelands and even reached right out to the mid gulf country, devastation is wide spread. Major problems exist with electricity, telephone, water, sewage and roads just to name a few (for the reader: being on a rural property only the electricity and telephone are relevant to us as we rely on creek and rain water). All such services are expected to be out of commission for considerable time. Of good news is that there seems to be no loss of life from Larry, hopefully it stays that way. Early radio reports and it sounds as if there is mass damage around the Innisfail region. If our forest is any gauge to go by, it would be expected that crop losses will be high. On a lighter tone, it is good to hear that the Aussie humor remains intact thanks to a local radio identity who normally uses the phrase 'where the rainforest meets the reef' has now changed his cheery quote to 'what's left of the rainforest meets the reef'. How true he is! Just about to head out to continue working on clearing the road. Another quick assessment before we start and from the amount of material still left to clear we have decided it would be best to cut a small track, wide enough for the motorbike. Ideally, we would like to make contact with the outside world and a colleague who may be able to arrange the delivery of a much needed generator. With radio reports of power outages in such a wide area, it is most doubtful we will be able to obtain a generator anywhere in north Queensland. Mid afternoon and we have managed to cut a track wide enough for the bike to get through. We pack Jack with rain coat and mobile phone, hoping it will work outside the property and send him off. Don't know how far he will get. It did take some time for him to return, on foot and soaking wet! First and most importantly, a generator will be air freighted from Sydney to arrive in Cairns on Thursday morning. That gives us another day to open up the road so we can get the vehicle out. Unfortunately though, the motorbike died which did not come as a complete shock; after all we did rescue it from under a pile of debris. Jack had to leave it on the side of the road and to try and keep it a bit dry he wrapped the motor with his rain coat. In all, today we saw quite a lot of insect activity while clearing the road. Ants, in particular Green Ants literally cover the ground and all fallen material. So many in fact, that we are all being constantly bitten as we work. Quite a good variety of butterflies are out and most seem to be in reasonably good condition, making you wonder as to where in heck did they shelter? Ulysses, Birdwings, Union Jacks (Delias mysis mysis), many Common Oak Blue (Arhopala micale) and even a single Glasswing (Acraea andromacha) specimen which are usually only here when extreme dry conditions prevail further out west. Most interesting were large numbers of flies congregating on the many sap flows. I remember after other cyclones it has not been uncommon to find sea birds recuperating down in the sheltered gullies, but no birds yet. In the forest there is a noticeable quiet all round, day and night. The brightest things in the sky at night are definitely the Fireflies. Listening to the evening news on the radio medical officers are advising people to take caution when clearing or working, for when it comes to receiving medical treatment 'you are on your own'. Roads through out the area are closed, leaving ambulance services unable to reach anybody; their only option is to give advice over the telephone on how best to treat any injuries. The Prime Minister, Mr John Howard and the State Premier, Mr Peter Beattie will fly into the area tomorrow for a first hand inspection. There are reports of some people being destitute and apparently asking for food at local supermarkets. All telecommunications are down, including the mobile networks. As the end of our second day closes, outside the complete darkness of the forest remains quiet. Even though we have a clear view all the way through to Innisfail, not a light is to be seen. Rainfall received previous 24 hours - locally 320 mm. Still can't believe the change in the forest. I could quite easily cry but I can appreciate the benefits to flora and fauna, especially insects from this devastation. Timber associated insects are certainly going to be on the increase for the next few years. We are unable to pick up local radio reception this morning, tuning to a tablelands radio station we find out our local radio station is out of action after damage to their roof. This means no local reports on Innisfail conditions are available. Reports are simple "damage to both the electricity and telephone networks is insurmountable". Many towers for these services are located in rainforest situations, with access to these areas a difficult task alone. Looking at our rainforest outside, I can understand that it is going to be one heck of a job! Food drops to outlining areas of Innisfail are underway. The Innisfail district has now been officially classified under 'State of Emergency', which means the Army will now be employed to assist in recovery. While yesterday we noticed a few planes flying overhead, overnight activity increased with the sound of large helicopters seeming to be endless. We assume they belong to the Army. We continue to work clearing the road, we are all anxious to get to town to get some fresh supplies, if available. Starting to see the occasional bird but numbers are definitely low. Flocks seemed to have been replaced with groups of 2 or 3 individuals and it is not uncommon to see birds down on the ground foraging through any flowers they can find, even seeing different species flying together. Most surprising was the quick emergence of a small bat from under the rubble as we cleared today, three days after the cyclone. Lucky bat! Insect activity can be seen all around in the forest with longhorn beetles (Cerambycids) and weevils (Curculonids) into the fallen timber and laying their ova. Something I have never seen in such numbers is the four o'clock moth (Dysphania fenestrata), all gloriously fresh. 3pm and we have opened the road so we are off to town, lets see what's outside our own devastation. Well, the visit to town was a most unbelievable experience, been through a few cyclones but have never seen such an amount of devastation. As soon as we had we driven out of the property the first site was of neighboring farms, many with collapsed sheds and roofs missing. Looking back at the property, all the hills sides are brown from wind burn with a handful of pockets of green left in a few gullies. Hercules, Chinooks, Black Hawks and other large aircraft literally filled the sky in all directions. Heading in to town, electrical wires were down across the roads everywhere and many roads closed due to flooding. We headed out the old highway which manages to stay open in most cyclones, luckily it was open and we could make it out to the main highway and on into Innisfail. Only similarity to what is going on around me is that of a 'war zone', as seen on TV. Normally, the 15 kilometer drive into Innisfail is adorned with banana and sugar cane crops but not this time; all crops were down, flat! Roofing iron was littered through the paddocks looking like tinfoil on a dead Christmas tree. Already I was appreciating the fact that our roofs seemed to have remained intact. On the main road into Innisfail debris is everywhere, buildings are down, roofs off but in that true Aussie style some locals were having a beer even though the pub they stood in had no roof. The supermarket was open but operating under limited generator power, so limited supplies. Ice had already been trucked in from Cairns, so with a couple of bags of ice and some fresh supplies we were off, all a little happier. No more hot beer and warm food! Access around town is limited but even such a short drive had its astounding sites, not just the devastation but more the number of television crews, it seemed as if there was a crew on each street corner! Going past the courthouse we estimate around 2000 people were waiting for assistance, housing etc. (for the reader: The Innisfail population is approximately 20,000) A large number of army personnel were present on the streets and have set up base in the town show grounds, a tangled mess of its own. The local show is held early July each year but one look at the grounds and I don't know if there will be a show this year? The Innisfail show focuses mostly on the agricultural sectors of the community but what can they show this year, no bananas, no cane, no fruit! Current figures on crop losses are running around 80 % for the local banana industry and then there's still sugar cane and exotic fruits. More rain overnight, who cares about how much, just too much! Usually in the morning the forest has quite a chorus of bird songs happening but until today it had remained rather quiet. Still only a very few but each morning a few more calls can be heard through the forest but still nothing like the volume we would normally hear. The local radio station is back on air after water entered their electrics, causing a fire to start up but luckily the fire service was able to attend and had it under control very quickly. There were some amazing figures being quoted this morning on the radio; an estimated $50,000,000 required for re-building; 30 kilometer strip of damage to the Great Barrier Reef; 9 out of the 15 bulk electricity towers are down and some areas will require a complete re-build; power outage covers a 200 kilometer coastal strip and all the way inland into the gulf country as far as the township of Croydon; bananas pre-cyclone $1.50 per kilo are now up to $5.80 kilo in southern supermarkets. And for any persons being or making it into town, the many offers of free food were happening from sausage sizzles on the street; pizza deliveries all the way from Cairns; hot pies from local and Cairns businesses. As planned we made our way to Cairns today and picked up the new generator. Now we have a few luxuries like fridge and television. On the way north to Cairns the road south was one continual convoy of service vehicles; SES, Disaster Co-ordination, Ergon energy, Telstra, Army, Police, every conceivable rescue and emergency group possible. Late this afternoon a large helicopter was heard approaching, so with interest we rushed out to see it pass overhead. To our amazement, we looked up to see a massive steel tower dangling on a 45 degree angle beneath an army Chinook helicopter passing directly over the house. I have heard on the radio these towers are for electricity purposes and a staggering 40 meters tall! The sky and what's left of the forest seems to remain a terrible two tone grey colour. Not much is happening, went to town for the second time today. Visiting town leaves you feeling quite despondent, I think I would rather stay home and deal with my own devastation, there is just too much of it everywhere and can be quite overwhelming at times. Today we were surprised with a brief visit from a couple of guys from the State Emergency Service, just checking that everyone is OK. As the main house is not our place of residence, they will put us on the list for assistance to cut our home access open. While we managed to cut the main road open, huge Wattle trees cover the road and are much too large for Jacks chainsaw. With the amount of damage just on a local scale, trying to get anyone to do some tree cutting is going to be difficult. One good thing, the telephone is starting to periodically work. Not knowing when it is working, we are surprised when it rings and quickly take advantage to make calls while it is operating. Last thing today, we finally set up an insect light to run off the generator, interesting to see what might be flying. Electricity still out. The sun is out shinning for the first real time; even the birds seem to be singing louder today. Only small numbers of small moths came into the insect light last night. Still no power. The forest is slowly coming to life, last night I heard the first chorus's from the Scrub Hens ( Orange footed scrub foul, Megapodius reinwardt) . Normally at night there is a riotous sound of scrub hen calls through the forest, last night I could count two birds calling. Top news today is the appointment of General Peter Cosgrove to head the Operation Recovery Task Force. Qantas airways are flying 3,000 volunteer trade people to start rebuilding. There are reports that some areas of Innisfail have received 99% of damage to housing alone. There are concerns that people will leave town, especially those associated with agriculture like the banana industry. By the end of the week it is anticipated bananas will become a scarce item on the supermarket shelves, astounding when in Australia bananas have the highest fruit product turnover per week. Up to 90% of Australian bananas are produced from the north Queensland region alone and up to 95% of that crop is now gone. An estimated 28% of Innisfail has some power either mains supplies or by generators brought in by truck. Our water supply is becoming low (for readers: normally we pump from the creek) even though it is raining we still have to rely on collecting rain water. Now with the rain easing we need to conserve what we have collected, mostly for drinking use. This means we have to head off down to the creek if we wish to have a bath. Well that's a real effort, climbing over tree, over tree, over tree just to reach the causeway makes having a wash a chore! Don't know if having rain is better? But we do need fine weather so we can keep clearing the mess. As it is, we stand to be on the receiving end of a mosquito plague with the amount of water lying on the forest floor. News of the day, local councilors fear a mass exodus from Innisfail is possible. More SES volunteers to arrive, they will be used to relieve the volunteers already working without a break since first getting to the area. General Cosgrove advises banks to assist with lower loan rates. Around 1,600 tarpaulins have been used by SES. Insurance claims so far number around 12,000, expected to cost as high as $250,000,000. More trades people arrive mostly to assist those with no insurance cover. Health authorities say there is no threat of any disease out break but they are concerned about mosquito associated viruses such as Dengue and Ross River Fever along with the rat associated Leptospirosis. While it was well in the past, I have experienced Ross River and Jack has had Lepto, leaving us both with strong memories of excruciating pain. Today we worked on our main greenhouse and while the frame was badly damaged and needs rebuilding, we were able to rescue many of the food plants inside. This house normally contains a majority of stick insect stock but still not a specimen to be found. With all adult material gone, we will start again from egg stock which is always housed indoors, stock indoors made it through Larry ok. We haven't made it through to the greenhouses out back, all in due course. Just before dark we had a visit from a Road Tek fellow, checking on road conditions. Although on private property, he has put us on his list for road assistance. He hopes in a couple of days. Would be good to get home and sleep in a real bed, camping on the floor for the past nine days is hard on the back! Talk back on the radio today and many locals were calling in with their cyclone stories. Of interest was the number of people who noticed the fruit bats were absent prior to the cyclone crossing the coast. Others report of horses coming together in groups and resting in gullies or lower areas, again prior to the cyclone. As with our insects, nature delivers the messages, we just have to learn to read them! Last night we saw a small glow of light coming from the Innisfail area. Most noticeable while in town today is the large machinery which has moved in, ready to start demolition. So many buildings are damaged and it looks like one whole side of Rankin Street is mostly out of action which unfortunately includes the town library, the respite centre for the elderly, the local newspaper and many, many businesses, all now out of business. Power is slowly being restored to business in town, but we are being told it will be weeks before outlining areas are reconnected to the electrical grid. Anyway, now with power coming back to the town hopefully this means the supermarkets will be able to restock their cold products. Today was the official first meeting of the Operation Recovery Taskforce headed by General Peter Cosgrove. The state premier Peter Beattie has said at least $20 million was needed to directly assist people but only $8.5 million had been raised so far through the Disaster Relief Fund. The aftermath of cyclone Larry still lingers, with the Gulf country counting major stock and crop losses as the flooding continues. There are reports of hundreds of cattle swimming for their lives but the concern is that they can't keep swimming forever. Working around the property these days you can see so much further, in all directions. I find sometimes it is easy to get momentarily disorientated even though we are working in an area that was previously clear, the forest has changed dramatically! It has become a totally different environment and thinking about it, I would go back to the thick dense forest in a flash but Larry changed all that. Another bit of Aussie humor today from a sign posted on the road into town reading 'NOT happy as Larry'! An unexpected visit from the housing inspectors just now, checking on the quality of housing in regards to demolition. We passed! Not much to achieve in today's weather. Continuing to operate the insect light at night by generator power but very poor and after all it is the end of March so maybe not so surprising for this time of year. Rain, rain and more rain, what more can I say! Another trip into town today, most noticeable was that we no longer drove over downed power wires and what was even better was the electricity workers in our local Garradunga area. Does this mean power is coming? This is the longest after any cyclone we have had no power; previously the longest was one week and a long time ago. On average we experience a cyclone every four to five years. Even though two weeks have now passed since Larry visited, not much seems to have really changed around the district. Many shops in town still remain closed as they have either no power or simply no roof! MacDonalds seems to be doing good business but even they operate under generator. The demolition of various buildings has cleaned up some of the town but so many houses still remain without roofs and some still have no tarpaulin cover. With the rain continuing as it is, inside these houses must be a complete wipe out! One thing new is the big bright pink 'N' that is appearing on houses and businesses all over the district. Apparently this means 'not suitable for occupancy'. The rain just will not stop and we really need to be able to dry out just a bit. After removing debris for the past however many days it has been, the yard has now turned to a gigantic bog. Even though it continues to be so wet there is a slow but noticeable increase in the variation of bird calls we are starting to hear in the forest. Still hard to accept the damage to the forest, for sure if there was a cassowary walking around anywhere out there you would clearly see it. Actually we haven't heard or seen a cassowary yet. Up home, if we ever get to return there, the sound of a cassowary is a daily occurrence. 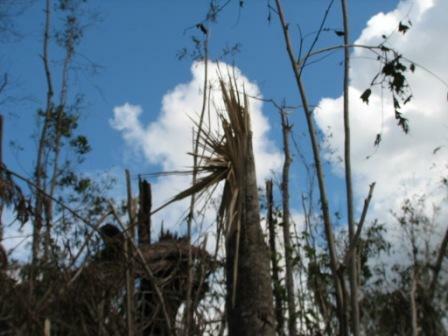 After other cyclones the cassowary populations have needed assistance due to lack of food available in the forest. The same will obviously apply this time. With the amount of fruit trees down and especially the Quandong (purple ) which is one of the cassowaries most favorite fruits, they are going to have it hard until next fruit season. No only for fruit, more than any other cyclone it is so difficult to get through the tangled mess in the forest; we even suspect it would be difficult for any cassowary that was lucky enough to have made it through Larry. A change to light showers! The best thing to happen since Larry just drove in. A crew of 8 State Emergency Service persons has turned up and I hope they will be able to assist us with opening the road up to home. The one criteria that must be met is that the house must be your place of residence, on this basis they will be able to assist us. Yahoo, we fit into that category! The sound of multiple chainsaws can be heard, again the best thing to happen in weeks. 7 hours later and they have cut their way through to the house. Along with Jack they all work furiously to get to the top. How's this for an end to the job. Jack said as they struggled through the last of the fallen trees, everyone simply dropped to the ground in relief. While only just finishing and chainsaws still running, an Alcidis metataurus (day flying moth) gently fluttered down, right down into the blade of the running chainsaw. I don't know if I can blame Larry for that one? With the size of the timber being so large, we now need a backhoe to clear the matter left. That gets us one step closer to getting home, but not tonight. After profusely thanking all the crew for their much appreciated help as we could not have cut the material and with timber cutters so busy around town, it will be weeks before we can get someone out here. Only one comment from the SES crew and that was 'got sunburned, couldn't find a shady spot to stand under'. We could not thank them enough for their help. This particular crew had traveled up from the town of Ayr, south of Townsville, today was their last day and they are off home tomorrow. Their only loss today, one chainsaw squashed under a moving log! Had my first visit up home today, still there is a mountain of debris which is needed to be moved before the road will be usable. Could not believe the views, Jack said 360 degree and he was spot on! While we were always in battle with the forest from reclaiming any open space, we now have total views all the way round into Innisfail and even to Mount Bartle Frere, never have we been able to see these before. Every bit of material that was outdoors on the porch was strewn throughout the garden, including the tool cupboard fully loaded. I remember thinking these things will be fine stacked up against the wall, after all we had done the same for every other cyclone. While there is some minor roofing damage, water does not seem to have gotten right in and hopefully the interior will be fine. Jack did manage to tie down any lifted roofing material the best he could so hopefully the rain will not continue to get in. Of concern though is the amount of external cracks in the house, especially the eastern and western facing walls which of course took the main impact from Larry. While it was great today to be finally able to get through up to home, it only seems like now we have another load of garbage to sift through and see what is salvageable. Still need more machinery to clear the large material from the road up home, now waiting for a backhoe to come. After the backhoe we will need a bobcat and excavator to remake the road. The road is a total loss. What can be said about the weather since Larry left, there has only been two days that we have actually not had rain! The rain is making for lousy conditions, both outside and inside. Outside the ground is just a wet bog while indoor we sit and watch either the walls turn to mould or the wallpaper falling off. Still no electricity. Today's interesting story comes from an Innisfail tackle shop owner. Apparently local fishermen visiting the reef where the cyclone traveled over have reported that the ocean stinks! Rotting coral and other shredded sea matter litter the water. Everyone agrees both strong tides and currents are needed to give the reef a good flush. Best day since Larry, the electricity is on! No more cold food and hot beer!! Add to that, the backhoe came and cleared the road up home!!! Now we can go home!!!! Great guy the backhoe operator, knew we still waiting to get home and although he had been working everyday since Larry with the local council, he kindly set aside a couple of hours late this afternoon and came out. Still unable to drive up home yet, as the road is completely washed out, it was a real effort just to traverse over the washouts by foot! The bobcat machine will be another couple of weeks before getting here. Anyway, we are half way there, being able to get home is a major turning point. So today we are a little happier, at least we can walk home. If there was trouble with the electricity we would have to stay in the main house. No thanks, tired of sleeping on the floor, I can do that anytime I go camping. Received around 5 inches of rain overnight, seems like it will never stop raining. I can remember right back to our early days of living on the property way before the houses were even built and our first introduction to the rains came in periods of 8 or even 11 weeks solid. The current conditions often take me back to our first days on the property, working to establish roads, in this case working to re-claim the roads. At this stage we have cleaned the main greenhouse which remains only half its original size for now. It is just far to wet to get any work done especially when it comes to building and welding. Trying to organize a builder, plumber, painter, any trades person is another frustration point. There is just so much damage throughout the district it will take weeks for anyone to get out here to make an assessment on the damage. One good point, if there can be one from all this rain is that with the heavy rains overnight bulk debris was moved from the road, so now the road is down to gigantic ruts and ditches. ' Be damned if it rains and damned if it doesn't', need to collect rain water for household use and at the same time need the rains to stop so we can get a dozer in and get to the water pumping systems. Heavy Rain - approx. 3 inches! Jack finally made his way down to the pump at home today. In every direction he attempted to head down to the creek he was turned back, a tangled mess of large trees everywhere, even across the creek. With the forest gone as it is, we can clearly see down to the creek, again something we could not see before. Of amazement was a gigantic dam that had formed across the creek, Jack estimates it to be at least 18 foot tall. We still need to get to the pump for the main house. Paul did manage to weave his way through a bit of the fallen trees only to see that when the trees fell their root systems ripped up the electrical cables. He didn't make it to the pump house, yet. He said he will keep working at it. So a fair assumption now is that both pumps are out! Now, this means clearing tracks to get back down to the creeks and re-establish the pumps, hosing and housing. I seem to remember doing this once or twice before, first there was the water-wheel then a few years later an electric system. Today marks the first calendar month since Larry came. We had a surprise visit from the Red Cross, just enquiring if we were OK or in need of any assistance. Their story was they had been out every day since Larry seeing people from Babinda to Cardwell. Most concerning was their interest in a family of four living in a tent some where in the local area. Apparently they were found sometime shortly after Larry, but the Red Cross had been unable to locate them since. Unfortunately directions for the family's whereabouts were not clear, simply stating 'at the end of the road'. Starting to notice a change in the wind sounds through the forest. From blowing straight through the almost naked standing timber with no interference between, now there is a sound of leaf movement in the winds. The forest is only now starting to get some amount of new leaf foliage which is slowly changing the forest from a burnt brown colour to a patchy green texture. Trees remain considerably bare stalks but now with puffs of green on the ends of their branches and many are developing their first shoots all along their distorted branches. This first month after Larry has been best described as a waiting period, waiting for something, anything to develop. But we stand in a lot better position than many people in the area, we held the roofs on the houses, able to get home and have the electricity on, many do not have these luxuries yet. With today's overcast skies we come to a grand total of 4 days without rain since Larry, so needless to say not much has altered or improved. It has been far too wet for any work to be achieved both here at the farm as well as in town. Shops and homes alike are still covered in tarpaulins; a few buildings have scaffolds erected around them, obviously in anticipation of the fine weather. As the cleaning continues more damage to the town becomes evident, even shopping in Innisfail today you will still commonly see buckets in shop aisles collecting dripping water from their ceilings. Local and state government departments have established a Building Coordination Centre, a one-stop-shop to assist with the rebuilding process, builders, plumbers etc. A regular site around town is still the continual flow of trucks taking debris to be mulched, the amount estimated to be equivalent to what would normally be expected over a 15 year period. Also in mind to keep the community up to date with developments is the 'Operation Recovery Update' newsletters which we have been receiving on a regular basis. A bit of twisted irony happened last week regarding the town library which was another unfortunate loss from Larry, the building was heavily damaged with water ingress a major problem, I think it was a loss of around 15 % of book materials. A number of relocate able buildings were being shipped by rail to replace local government buildings including one for use as a temporary library. While on a rail siding in Brisbane the unit earmarked for the library was trashed by vandals, not sure when a replacement for the replacement will be available? You never notice how much you use a service until you find yourself saying 'I'll just pop into the library and, oh'! We now have the roads to both houses clean and traversable, most expensive was the road up home costing just over $4.000.00 to rebuild. In regards to repairs to both houses, well that's a time game at its best. We will have to be patient. We have located one water pump, found under a few trees and as if we didn't expect it, beyond repair. Still haven't quite got to the other pump as it is buried deep beneath trees and other forest debris. Will in due course need some large machinery to work the areas that were once our cleared areas, this includes areas where many different research projects were usually conducted and access to the top of the hill again. Hold no hope for the roofed in area we established off to one arm of the track to the top of the hill, this was an area we used mostly for night studies, hence the roof as it is known to rain here occasionally. Mount Bartle Freer which is just to the west of our property is renowned for an average rainfall of 10 meters. Insects have shown their resilience to the devastation. Of most notice through the whole period since Larry, has been the amount of micro-fauna which has emerged. Not apparent till at least 2 and 3 weeks later, both the build up of decomposing matter that became available plus the follow of continual rain has been ideal for many insect orders: water beetles (Dyticidae) , flying ants (Formicidae), carabid beetles (Coleoptera), ground and mole crickets (Orthoptera) and a world of microscopic tiny flying thingy's. Green ants (Oecophylla smaragdina) seem to have returned to the higher foliage as opposed to the closer to the ground matter they had been reduced to. Moths have been appearing at the insect light in droves nightly, again few species but in absolute profusion. The temperature is now dropping considerably as we head into winter so it is anticipated that these moths will drop off soon. Birds have picked up in some numbers but still nothing in comparison to what we would normally see or hear. There has been the appearance of birds suffering from starvation. Only last week Jack found a Spotted Catbird (Ailuroedus melanotis) sadly in its last moments of life, such birds are fruit feeders of which none exists in the forest at present. Other people report of such similar sightings around the district. Only one Cassowary has been seen on the property, it is a daily occurrence to at least hear them calling through the forest. Relevant authorities have started a feeding program to assist the birds in the areas south of Innisfail. In the workshop we are starting to pick up with a few species lost. A laugh at the moment is the cost of bananas at $10.00 per kilo, too expensive to use as insect food so we have changed to a slightly less expensive alternative that being grapes, $5.00 kilo. About the only insect to have completely made it through the experience is the roaches (Macropanesthia rhinoceros). The main focus at this stage is to either trim or try to re-establish the insect plants which were damaged, many are simply too bashed and trashed to save and some of these will take years to replace. Often Jacks plant propagation relies on seed collection from stock not available from regular nursery suppliers. On a final note, we were recently asked 'were you terrified'? Couldn't answer this question at the time and really needed to sit down and think about it. After discussion both Jack and I agreed on a simple no! But that's not to say we weren't terrified without knowing it. Let me explain. Sitting indoors, unable to see what was happening outside, I was envisaging the damage associated with any other cyclone I had been through before and at the most that was a cyclone 3. Had been through that many times before, could picture that sort of damage and was certainly only anticipating that same degree. One thing different that I do remember with Larry was the regularity in the amount of times my body jumped in reaction to large and obviously dangerously heavy chunks of rainforest hit the house. Have seen the house windows flex before under the winds but the quantity of debris pounding the house was definitely unique to Larry. Emerging after Larry and seeing the far exceeding amount of devastation, I now know how devastating a cyclone 5 can be. I know Darwin was wiped out by a cyclone 5, saw the devastation on TV many times, but the old saying 'nothing like first hand experience'! It was only a matter of a few weeks after Larry and another cyclone was heading towards the coast. This one headed straight across Cape York, continued through the Gulf of Carpentaria and made a line towards Darwin. As it approached Darwin, the cyclone was recorded with 350 kilometer winds, a cyclone 5+. I honestly felt with a complete understanding that these people could be wiped off the face of the planet yet once again. It was at this point I realized that now knowing what such a force of nature can be like, I would easily say I was terrified for the people of Darwin. I watched the tracking of that cyclone with just as much interest as a cyclone heading this way, I was very happy when it did cross land, south of Darwin with winds of considerable less extent. I can honestly say that if a cyclone of such strength was today heading towards us I would without a doubt be terrified and that I have now come to realize that cyclone Larry could have been, maybe some would say was a life threatening situation. 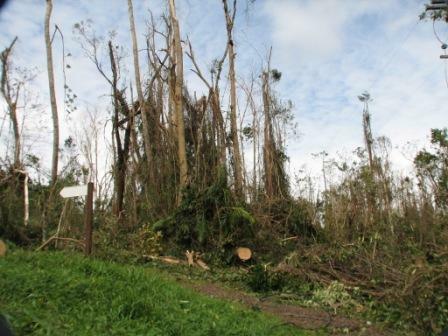 Damage to sugar cane and other crops to cost $300 million. main house requires some minor repairs, rain gutters, external and internal painting, some external wall repairs. We would like to extend our most sincere thanks for the many that emailed or called to enquire how we fared from Larry. From my own perspective the many after thoughts and wishes received from people both here in Australia and from our many clients overseas, I extend my personal appreciation as they were received at a time when they were needed the most. Thank you all and we will recover.